While the events industry is booming, some hold concern that local manufacturing of commercial furniture is at risk of being pushed out by cheap imports from overseas. Affordability, design and quality are proving to be more important than ever. Events & Equipment spoke with a number of furniture manufacturers about trends, challenges and the state of the industry in Australia and New Zealand. The past 12 months have been a difficult time for the industry, according to Director of Lifetime Industries, Stephen Popplewell. With a number of international companies offering cheap imports, it has been particularly important for Lifetime Industries to focus on product quality and after sales service. “Sales of furniture are down. Rental companies seem to be purchasing cheap imported products from other suppliers,” Mr Popplewell said. In a digital age where buyers expect rapid production and delivery times, it has been important for the company to be as prepared as possible for purchases and to ensure purchases are worthwhile for its customers. To do this, Mr Popplewell said that Lifetime Industries aims to supply quality products that last while also offering spare parts and repairs. The company also keeps stock of all its products to ensure that supply is as immediate as possible. He is concerned about a slowing of business for local manufacturers and said there has been a noticeable decrease in sales, with many buyers looking at initial cost over quality or long term affordability. “It is slowing down for us. There are many suppliers of cheap, imported, competing products which are not of the same quality – but that seems to be what the market wants,” he said. In a competitive market, Mr Popplewell said that there are still new players entering the industry. In his experience, many of these newer manufacturers are also concerned with low costs and fast production. The same is true for new buyers and rental companies entering the market and looking to buy furniture. “There are some new players – they import everything and their products won’t last long. Products are often replaced within a year of purchase,” he said. The difficulty for companies such as Lifetime Industries is that they are left with only two options moving forward. “As the customers now seem to want this type of product, we have been forced to compete or find other markets for our goods,” Mr Popplewell said. While it makes sense for Australian companies to buy within Australia, he believes the local market is being overlooked. “We are a manufacturer and the local market does not want to pay for locally manufactured goods. We already import some goods for this market – soon there will be no local manufacturing,” he said. Research published by the Industry Capability Network shows that for every $1 million of new or retained manufacturing business in Australia, $333,900 worth of tax revenue is generated, $95,000 worth of welfare benefits are saved and 10 full-time jobs are created. For now, Lifetime Industries is focusing on making its products as affordable and attractive to the local market as possible in the hope of retaining business and continuing manufacturing. “We are about to commence selling a new folding dry bar. We have been selling one for many years, but the new one will be more affordable,” Mr Popplewell said. With affordable options, the company hopes to compete with cheap imports without lessening the quality of its products or ceasing to stay on-trend. In this competitive landscape, New Zealand company, Alloyfold, has spent the last 12 months keeping on top of trends and providing a range of new products to its buyers. It has also discovered the importance of ensuring affordability without compromising on product quality and design. “The market is always competitive. There are always people fighting for same market share and that’s why we continue to ensure our products and services meet our customers’ needs,” Alloyfold Marketing Coordinator, Nina Campbell, said. “Alloyfold has always sought to develop products to suit the demanding criteria of the industry. Extreme durability, affordability and practicality are what we look for when we add a new product to our range. We are specialists in providing products that suit our customers’ needs for superior return on investment,” she said. In order to provide the market with products that are new and on-trend, Alloyfold has recently launched a range of products and has also returned to some older designs to improve them. “We’ve launched a new range of premium banquet tables. 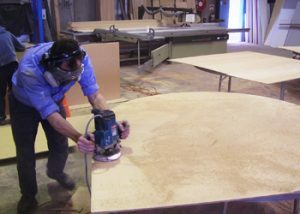 The reinforced, blow moulded table tops still feature the same strength, heat resistant materials and ISO quality ratings as our popular blow moulded range, but they are styled with a table top, leg finish and design features that require no covering and remove annoying leg braces that impede a diner’s legroom,” Ms Campbell said. 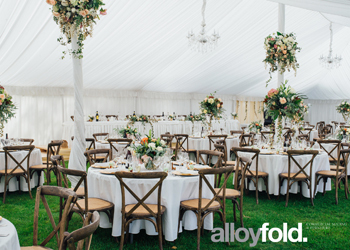 As well as providing new event furniture, Alloyfold has found it is also beneficial to offer decorations and accessories to its customers. According to Ms Campbell, these accessories not only make it easier for customers to style furniture for events, but also make a great add-on sale to increase value for both the company and the customer. “We have just started offering lycra table covers which, as you would imagine, are a great add-on rental for hire companies to offer to their customers. They are machine washable, low maintenance and create a sleek look for parties or events. These are really popular and we have expanded the range this year to include lycra covers for some of our contract chairs too,” she said. According to Ms Campbell, big events such as weddings can drive trends and therefore, drive design. As trends have developed and changed over a number of years, Alloyfold has improved its existing designs to cater to popular demand. “Vintage and rustic themed events and weddings have become increasingly popular. Alloyfold introduced the Crossback and Bentwood chairs to our range. We re-engineered these classic chairs to ensure even greater structural integrity; a design unique to Alloyfold. Our customers have loved it and we have received lots of great photos of these chairs in use,” Ms Campbell said. “We aim to act as a source of ideas of what is trending and aim to provide product inspiration to our clients in the hire industry in New Zealand and Australia,” she said. Having a clear point of difference in the industry has proven important to Alloyfold. With industry demands and so much competition for market share, both manufacturers and customers are struggling to distinguish themselves in the industry. “Health and safety legislation changes have meant a pressure for the industry as a whole. Competition in the market, economic pressures and the ever changing digital world keep challenging us all in business. Many of our customers talk about the challenges of differentiating themselves in this environment,” Ms Campbell commented. One of Alloyfold’s clear differentiations is its charity involvement, and the way that it looks beyond the industry with a view to invest in people’s lives. “Alloyfold is a social enterprise. We are owned by Pathway Charitable Trust and profits from sales are invested into helping people make a fresh start,” Ms Campbell explained. Pathway, which owns Alloyfold, started making chairs in 1998 as a way to fund its other passion – to help and support people in making great life choices. With its extensive range of commercial furniture, it assures customers that by buying one or many pieces of furniture, they will help at least one person. While Nufurn finds the market to be competitive, its National Sales Manager, Rossie Symmans, said that he believes there is plenty of room for both large and small manufacturers to make their way in the industry. By working directly with customers to produce products that meet the needs of the market, Mr Symmans said that the company has built a range that is on-trend and of high quality, which is mutually beneficial for the company and its customers. “We are constantly working with our customers to ensure we are bringing products into the market that benefit their businesses. 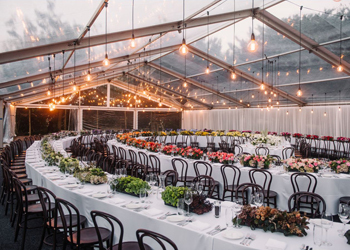 Recently we have seen a bit of a return to the past with Timber Chiavari Chairs, Folding Chairs and Cross Back Chairs coming back into fashion. Whilst the white and coloured resin versions are still ultimately more durable and popular long term, the rustic, country style and industrial themes that have spread over the past couple of years look like they will continue for another couple of seasons at least. This is great news, as it allows business owners to invest a little more initially to get a better quality product with the confidence that they will get a few years’ worth of hires from their investment rather than a mad rush for six months, followed by nothing at all,” he said. As well as catering to new and returning trends, Mr Symmans explained the importance of having tried and tested ‘staples’ as part of a product range. He said that providing the basics is important, as is introducing customers to new alternatives. “We continue to offer the very best quality industry staples, such as the Nufurn Barrel Chairs, Nufurn Gladiator Chairs and Max Tough Tables; however, we have introduced our customers to a full range of stacking European Bentwood Chairs as well as contemporary seating that you would expect to find in your local trendy café, bar or club. Our Athena range of cross back timber chairs are particularly popular at the moment, as they cover a wide range of event types rather than overtly being a corporate or wedding product,” he said. Over the coming 12 months, the company intends to continue listening to its customers and closely watch trends in the broader hospitality market. According to Mr Symmans, Nufurn works hard at developing and maintaining key points of difference in the competitive market. In order to stand out in the crowd, the company diligently focuses on durability, quality and team development. “Durability and quality are the cornerstones of our design process. Any product that we develop and offer to the market is stringently tested to ensure that, rather than competing on the basis of being the cheapest, we compete on the basis that the product will bring a return to the business again and again for many years,” he explained. Equally important to the durability and quality of Nufurn’s products is the care and consideration taken in its team development. Having the right team on board means that product quality is better, customer/manufacturer relationships are stronger, and the outcome for all involved is more positive. “The best feedback we receive is from customers who took our advice regarding the best product for them to stock and are now hiring them out quicker than they can turn them around. We take so much pride and inspiration from our customers’ progress that we will never reduce the quality of our product or service to join the crowd simply competing based on a low price,” Mr Symmans said. Nufurn was voted the ‘Most Trusted Brand’ by readers and subscribers of Hospitality Magazine in 2016. “This is a great reward for the dedication of our team to ensuring that we do what we say we’re going to do, when we say we’re going to do it. We love what we do and that comes through to our customers,” he said. What Mr Symmans loves about the furniture and decorations market is that there is room for everyone. “Full blown, corporate event companies exist in the same marketplace as a small scale company specialising in just one or two unique products. The idea that all hire and rental companies would run the same three basic chair options – Resin Stacking, Resin Folding, Basic Banquet – is seriously outdated,” he said. Cheap imports entering the market are often copies of popular quality designs, and could pose a risk to the industry. Nufurn is consistently warning its customers about low-quality copies that won’t provide value for money. “Again and again we repeat the same warnings to customers. Don’t buy cheap knock-offs. Don’t buy products with no warranties. Only buy Commercial Rated products, from commercial furniture specialists, with commercial warranties. Don’t be sucked into saving a couple of dollars now or have your arm twisted by someone offering you a deal to ‘fill a container they are just about to ship’. These are deals that are in the suppliers’ best interest, not the purchasers’. These are suppliers that focus on making a profit today, not on what will benefit your business in the long term,” Mr Symmans warned. For Nufurn, the supply side of the market remains competitive; however, Mr Symmans said that some of the ‘opportunistic’ suppliers of the last few years have gone out of business as more customers are burned by cheap, untested variations. The main operational challenge of servicing this marketplace, for a larger volume manufacturer like Nufurn, is ensuring that it is carrying enough stock of enough different products that a client can book chairs onto several jobs before they even purchase them. “They can do this safe in the knowledge that Nufurn can deliver quickly once they are ready to order them. This is a very cash flow positive option for businesses, as investing in quality inventory upfront can be quite daunting for some,” he said. Mr Symmans said that the consumer side of the market appears to be very stable at the moment. 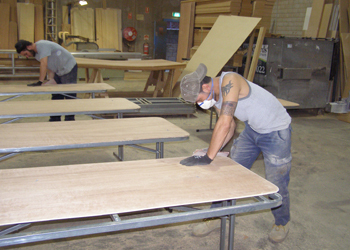 In the future, Nufurn plans to continue producing durable, high-quality furniture to meet the needs of the market. “We’ll keep listening to what the market is asking for and make sure that our response is carefully thought through and thoroughly tested,” he said.